Finkelstein, Maxwell W.. "Georgian Bay Islands National Park". The Canadian Encyclopedia, 24 January 2018, Historica Canada. 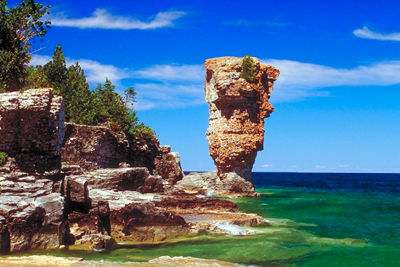 https://www.thecanadianencyclopedia.ca/en/article/georgian-bay-islands-national-park. Accessed 25 April 2019. Northern Beausoleil Island is the largest of the 59 islands in Georgian Bay Islands National Park (photo by Greg Gemmell, courtesy Parks Canada). 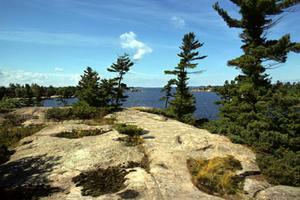 Many of these islands, part of the Canadian Shield, are stark and windswept, and inspired many Group of Seven paintings. 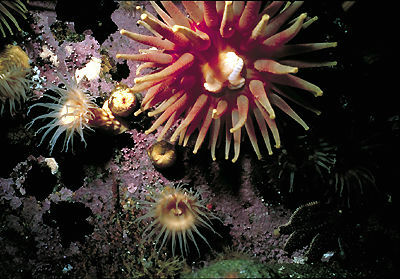 Although small, the park protects several unusual species. Beausoleil Island, the largest park island, is one of the last strongholds of the Massasauga rattlesnake, eastern Canada's only venomous snake. In fact, the park holds the title of having the greatest diversity of reptiles and amphibians of any Canadian national park. Other noteworthy species protected include the eastern fox snake, hognosed snake and spotted turtle. Several rare plant species are also found in the park, including the endangered forked three-awned grass. Over the last 4000 years, Beausoleil Island has seen many different hunting and fishing camps made along its shores by nomadic peoples of the Early Woodland cultures. 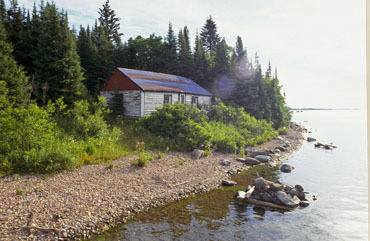 Ojibwa lived here in the late 1800s. The area has long been famous as a boating mecca. The park has 9 docking areas, and campgrounds on Beausoleil Island, accessible by boat only.